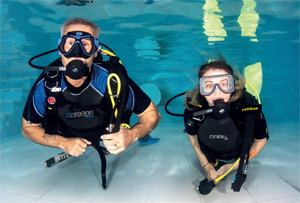 Try Dives begin at 8.30pm on a Tuesday night at the Highgrove swimming pool. They cost £25. We provide the diving equipment and you need to bring swimwear, towel and a £1 coin for the locker. Select a date you would like a Try Dive. We will endeavour to meet your chosen date but until it is confirmed we may change that date depending on instructor availability. Please add a little about yourself. Your interest in diving. How you learnt about us.